In the early 4o’s Don Faurot came up with the option concept for the game of football while watching a basketball game. The insight came after watching a 2-on-1 fast-break. Faurot noticed the defender could not make a play if the offensive players executed properly. If the defender decides to pressure the ball, the ball handler makes a quick pass to his teammate who scores a basket. If the defender decides to cover the player without the ball, the ball handler will not pass and score a basket on his own. This insight has brought us, in my opinion, the best offensive concept in football. 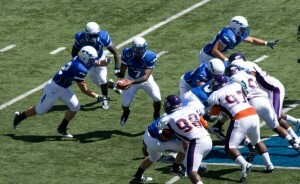 An option offense is predicated on the concept of putting one or more players into the same situation as the defender caught in a 2-on-1 break. It doesn’t matter if you are talking about the midline option, the zone read, or the inside veer…all use the same basic principle of forcing a defender to make a choice and then making him pay for it. For illustrative purposes I will use the triple option play out of a Flexbone set to show how an option concept works. The diagram below shows which offensive players have the “option” of receiving the ball during the play. The first option in this case is the Fullback. The second option is the Quarterback. The last option is the backside Slot Back. In order to defend the triple option effectively, the defense will need to have three unblocked players in various areas on the play side. As the diagram below shows, the defense must have a player for the Fullback, a player for the Quarterback, and a player for the Slot Back. Additionally, in this set, the defense must also defend the Split End and the vertical threat he presents. The key concept of any option play is isolating defenders. The offensive team will begin by identifying the players they will isolate. The isolated players are known as read keys and will be left unblocked. The offense will then attempt to seal off (block) remaining defenders to create the necessary isolation. The first isolated player in the triple option is known as the Dive Read. This is usually a player on the line of scrimmage and is determined by a rule. In this case the rule states, the Dive Read is the first player who doesn’t have a shade on the play side guard. In most cases this will be the defensive end on the triple option. In this count system, he is labeled #1. The next isolated player is the Pitch Read. This is usually the next hard run defender outside or behind the dive read. For us, this is usually the play side outside Linebacker. He is labeled #2. Some counting systems will go on to count a #3 and a #4 and will base their blocking schemes on the defensive alignment. I will cover this at another time, however, it is not necessary to understand the basics of option football. The diagram below illustrates what the front side of the triple option play looks like. The inside is sealed off by blockers, the Dive and Pitch Reads are unblocked, and the Corner is blocked by the Split End. The Quarterback gets the snap and must get his eyes on defender #1. This is his first read. The QB’s decision to hand the ball off or keep it is based on what the defender does. If the DR sits outside and does not collapse inside, the QB has a give read and the ball is given to the FB. If the DR crashes inside, and takes the path of the FB away, the QB keeps the ball and progresses to his next read. Once the QB has gotten a keep read, he immediately gets his eyes on #2 (the Pitch Read). Once again, the QB’s decision is based on what the defender does. If the Pitch Read sits outside and/or covers the pitch back, the QB keeps the football and gets up field. The 3rd option occurs when the Pitch Read does not cover the pitch back. If the defender crashes inside, the QB will pitch the ball to the Slot Back. This will happen just before the QB is tackled or when the pitch back has leverage on the Pitch Read. Below you can see a complete diagram of the triple option out of the Flexbone. The offense seals off all backside defenders while also securing the play side perimeter players (Corner and Free Safety). The Dive Read and Pitch Read are left unblocked and the play develops through the two read progressions outlined above. The play stretches the defense horizontally and forces the two unblocked defenders to defend three potential ball carriers. This is a fast break and we all know that leads to scoring points. Questions or Comments? Let me know what you think.